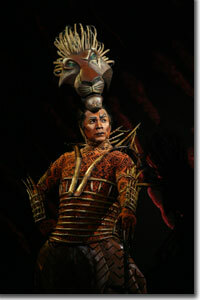 When The Lion King opened its first national tour in Denver in 2002 (to read previous review click here, then click the backward arrow on your browser to return), it was greeted with the same amazement and enthusiasm as it had generated on Broadway from the time it first opened there on November 13, 1997. That means when this run closes in Denver, the show will have been in production exactly nine years. The Company performs "He Lives In You"
This represents an entire generation of kids that have been brought up on Simba's coming of age and on the timeless African philosophy handed down to him from his father, Mufasa, the medicine woman Rafiki, and a host of other anthropomorphic characters from his 'hood. Given the number of international and national productions that have been mounted or are still up, it would be easy to quibble over comparisons between this Mufasa and that Simba, or this Rafiki and that Nala, etc., but such an approach misses the point of the overall effect, and the profound and consistently professional nature, of the show. When Disney Theatricals stepped out of character and hired Julie Taymor, with her deep appreciation of world theatre, to adapt the original animation for the stage, they were correct in assuming that probably no one else could have pulled this off. Oh sure, the techniques she uses—masking, puppetry, and silhouette—have been around forever; but the genius of artistry is in the recombination of archetypes, and here Taymor's work still exceeds anything that's been attempted in this genre. In pushing the envelope, Taymor has freed art directors in ways beyond our ability to measure. 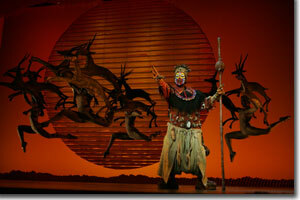 The opening scene, "The Circle of Life"
While the production's thrills remain for returning audiences, first-time attendees will gape slack-jawed at the opening congregation of species and the astounding craft work that their masks and mechanics represent, as well as the ingenious stampede, and South African composer Lebo M's soul-stirring native melodies. It's also apparent that the minimum age for kids ought to be around 5 years, as the younger ones seem to be too restless, too scared, or too tired to weather the intense, two and one-half hour show. There are still good tickets left—albeit mostly for Tuesday through Thursday shows—and the long run provides plenty of opportunities. 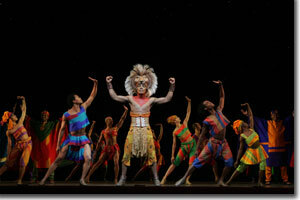 Denver Center Attractions presentation of Disney's The Lion King runs through November 12th. 303-893-4100.